People who are just looking can easily sneak past your trade show display without engaging in further discussion and most likely they assume the crowd is so thick that they will never see you again. No harm no fowl. And yet, if we accept the “just looking” excuse we will never get anyone to enter the booth. In our years of experience with the trade show industry, we have observed many different sales approaches to encourage booth traffic. However, one that is most surprising is the one where sales people take a “wait and see” stance. They were pleasant, smiling, saying hello but they didn’t really engage with the prospect. They allowed the “just looking” to look elsewhere. 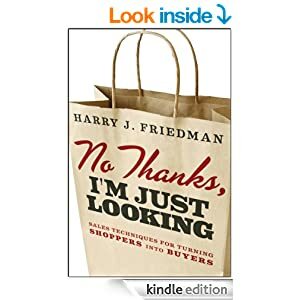 Harry J. Friedman has written a book entitled: No Thanks, I’m Just Looking: Sales Techniques for Turning Shoppers into Buyers. Although the trade show experience is different from a retail shop or a manufacturing sales call, much of what he says can be applied to making your trade show participation fruitful. He starts his book by stating the fact that although YOU believe you are different from the competitor…the customer won’t see that without some assistance from you. “No matter how unusual you think your (company) is or how different you think it is from someone else’s ware, the truth is that customers don’t appreciate the same distinctions that you do and may regard what you have as just about the same as the next salesperson’s. So, if your merchandise is not perceived to be substantially different from that found in other places, why will shoppers buy a product from you, instead of buying it from the store (trade show booth) down the street? A trade show event is the most concentrated experience consumers have to visit all of your competitors under one roof. Upping your game to connect with prospects is even more important at a trade show. Eye contact: Look prospects in the eye so they know you are talking to them. Smile: If you just give eye contact, it can be misconstrued, but adding a smile shows that you are friendly and hopefully gives a message that you are approachable. Verbal connection: Ask a question, make a comment or simply invite them into the booth. Eye contact and smiling aren’t enough to get them across the threshold. Observe:Quickly assess if they have a buyer or vendor name tag on or if they are wearing a sports jersey or have just come in out of the rain, gives you something to talk about. Hopefully you will stop them in their tracks and they’ll feel inclined to come talk further. Humor: Set yourself apart by using humor in your initial comments. If your competition just makes eye contact and smiles and you hit them with a quick quip, you might get them chuckling enough to engage in further conversation. If you have some crazy, fun ideas for attracting customers into your booth, visit us on Facebook and share!